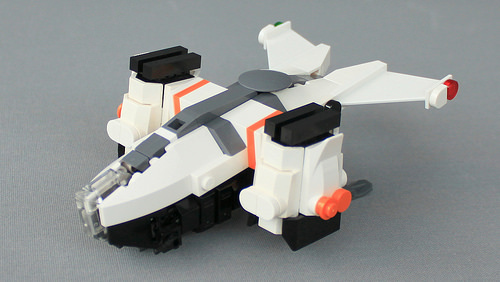 LEGO dropships are a favorite subject for many sci-fi fans of both movies and video games. While this particular model by Oscar Cederwall is original, it does seem to take some inspiration from the dropship featured in Aliens, which also includes a deployable vehicle. The craft features some heavy-duty thrusters, along with great color accents like the orange stripes. A mini-drone, cargo, and a vehicle with some nice details like steering, round out the scene. 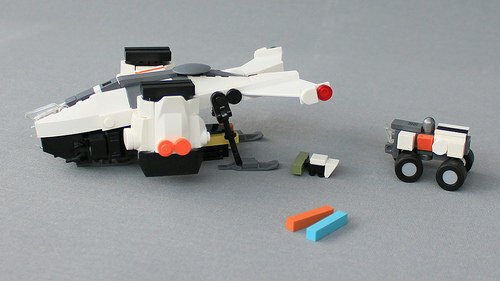 Some Modulex pieces make great stand-ins for cargo pods.